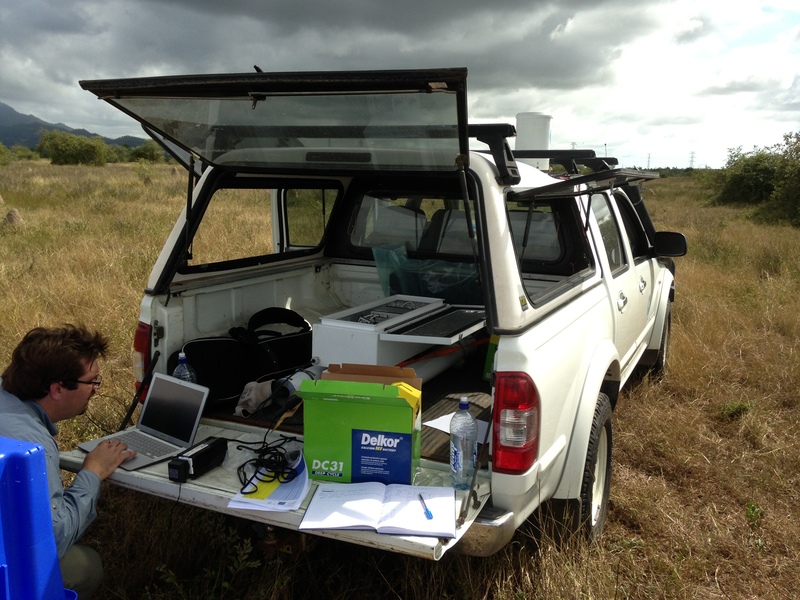 Trenton Franz conducts field work with the cosmic-ray neutron rover in Australia. A cosmic-ray neutron rover may sound like something from a science-fiction film, but a University of Nebraska-Lincoln researcher is developing the high-tech tool to help the military better understand the harsh environments in which it operates. Hydrogeophysicist Trenton Franz is exploring ways to use a soil moisture detector he helped create for agriculture to enable the military to quickly and reliably survey, monitor and map soils. "Soil water content affects a range of processes and decision-making, from irrigation management to optimize water usage to weather forecasting," said Franz, a Robert B. Daugherty Water for Food Institute faculty fellow. "The military, like many other sectors, needs better datasets." For example, when considering whether to deploy soldiers in remote locations, a critical factor is travel time to that destination. Poor soil stability can cause tanks and other heavy machinery to get stuck in mud. Franz's cosmic-ray neutron rover would allow the military to make soil maps on the fly to better predict how long it will take to get somewhere with large equipment. The rover provides accurate, real-time soil moisture estimates by measuring subatomic neutron particles in the air above the soil surface. Cosmic rays, or particles, enter the earth’s atmosphere and travel to the surface. Its neutrons are absorbed into the soil, but some escape back into the air. The amount that escapes depends on the soil's hydrogen content, which is largely determined by the amount of water present. Measuring the level of neutrons in the air provides a reliable estimate of the water in the soil below. The rover measures soil moisture every minute with a horizontal footprint of a 300-meter radius circle and a penetration depth of 30 centimeters. Franz said one of the probe's most exciting features is its mobility. "One could use the instrument to take mobile surveys from a vehicle, farm equipment or low flying aircraft," he said. "You could potentially mount it to the wall of a tank or drop it out of an airplane anywhere in the world and take measurements in a matter of minutes." Despite its importance in many scientific disciplines, the ability to measure soil moisture is largely restricted to small and very large spatial scales, leaving a critical measurement gap. Franz's research aims to reduce uncertainty in converting neutron counts in soil water content. "Instead of gathering datasets using the labor-intensive practice of placing probes directly in the ground at multiple points or through satellite-based remote sensing, the rover allows us to gather valuable data that may be missing in between," he said. The tool is also being used to advance the military's climate modeling and weather forecasting capabilities. Data from the rover is fed into weather and climate models developed by the U.S. Army Engineer Research and Development Center's Cold Regions Research and Engineering Laboratory (CRREL) and the Air Force Weather Agency to refine and validate their models. Franz first developed the tool to create more efficient irrigation systems, enabling farmers to better manage water resources. To explore military applications, Franz received a one-year exploratory grant funded by CRREL in association with UNL's Great Plains Cooperative Ecosystems Studies Unit and coordinated through Kurt Preston, associate vice chancellor in UNL's Office of Research. Franz's research is an example of how the University of Nebraska uses its resources and expertise in water to help address challenges beyond the state. Soil is a vital component of our environment. Understanding soil water content helps us grow more food with less water -- and better prepare troops on the front lines. For additional information on Franz's research, go to http://go.unl.edu/69o5. The Robert B. Daugherty Water for Food Institute was founded in 2010 to address the global challenge of achieving food security with less pressure on water resources through improved management of water in agricultural and food systems. It is committed to ensuring a water and food secure world without compromising the use of water for other human and environmental needs. The University of Nebraska has invested in four interdisciplinary, universitywide institutes -- including the Daugherty Institute -- that leverage talent and research-based expertise from across the NU system to focus on complex state, national and global challenges.